Forget about wasting time on analytics and risk management, switching between exchanges, investor distrust and funds transferring. Find investments, create a portfolio and trade. During hard times in the market, only few funds and traders manage to keep earning; thanks to analytics, in-depth monitoring and investment management. Fund Platform brings together the best experience in the industry in one place to help you stay in the green zone and expand. Send an invitation to your clients and they will get full access to your trading statistics and a personal investment account. Accept investments, manage clients through either CRM or administrator's personal account. Connect up to 20 exchanges and monitor your trades. Create a unique investment portfolio, manage it in real time and get access to a convenient trading terminal. Easy to work even on a smartphone or tablet. All reports and analytics in one place - customer list, portfolio changes, trading history, financial analysis. 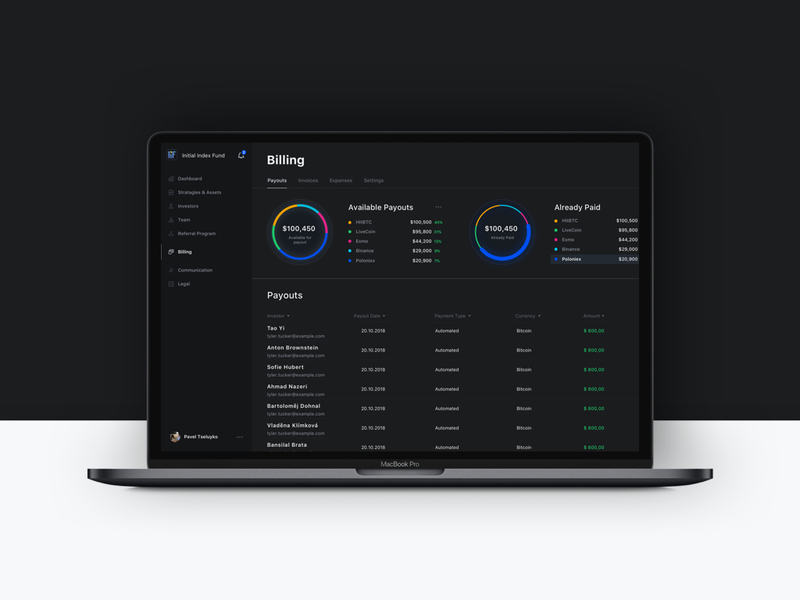 Get a complete picture of the status of your portfolios, expenses and automate payments to your investors and traders. "We started trading with $ 3000 on my account a year ago without understanding how to manage funds properly. Fund Platform team helped me us attract investors to our trading strategy and set everything right." "Anyone who wants to bring funds management in their company to a new level should try Fund Platform at least once. You will forget how you spent a couple of weeks earlier on technical management"
"We've been working with these guys from the start. It is pleasure to see the development of the product." We always talk to our clients and share useful content. Follow us through the links below and be happy. Please use your work email address so we can connect you with your team. Thank you! Our software is under updates. We will email you shortly.